The Amsterdam bed frame is a contemporary take on the traditional shaker style. 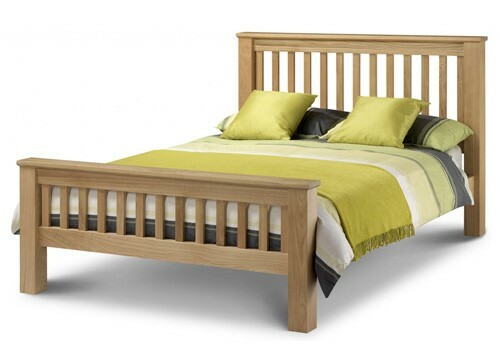 With a solid oak build and sprung slatted base the Marlborough ensures quality and comfort. With a simple, contemporary design the Amsterdam bed frame is an ideal fit for many bedrooms. The design has a high head and foot board with slatted detailing. The bed frame fits a UK standard double mattress (135x190cm) which sits upon a robust, sprung slatted base. The mattress is not included and will need to be purchased separately. The Amsterdam oozes quality with its robust build in solid oak with solid oak veneers. A contemporary design, inspired by the traditional shaker style the Amsterdam bed frame has a solid and versatile look which fits well in to both contemporary and traditional settings. The bed has a beautiful oak finish which enhances the homely look in any space. Constructed from solid oak with solid oak veneers the Amsterdam bed frame has a durable, high quality build. Complete with a sprung slatted base, helping to prolong the life of your mattress and ensure a comfortable night’s sleep. The Amsterdam has a quality build which is sure to last the test of time. Maintenance is simple, a once over with a duster or dry cloth will keep your frame dust free and pristine. Self-assembly will be required as this bed will be delivered flat packed. We would recommend two people for assembly, to ensure a safe and quick build. When moving your bed in to its final position it is always best to lift rather than push or pull, to avoid incurring any accidental damage. Question from patrick: Asked on 16/06/2014 which parts of the amsterdam frame are solid and which are veneered?